The February box comes with the tag line of a ‘self-love’ parcel, and I think it’s more of a ‘feel good’ vibe that would cheer you up when you can get a bit down during the chilly and dark winter months. 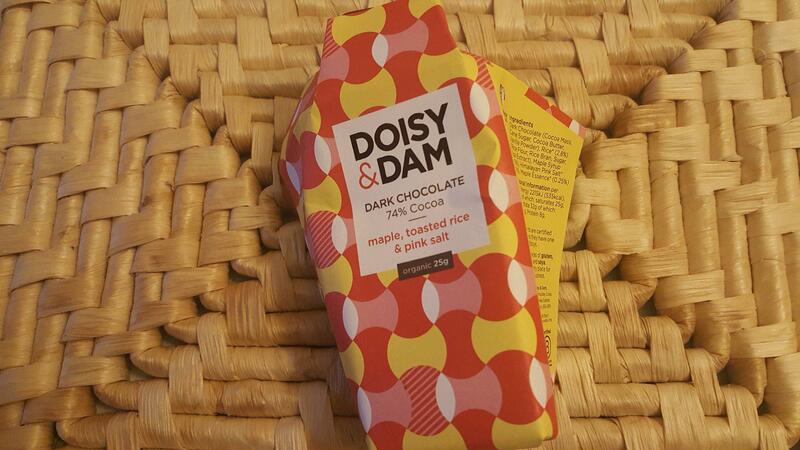 As you can see from the photo, the Doisy & Dam chocolate bar was a success, and next I tried the Scentered Therapy Therapy Balm, which is a lovely lifestyle item to have. You simply apply it to your temples or forehead when you are a little tired or stressed, or if you feel a headache coming on. It also relaxes you, and I’ve used similar balms before, and are great when you are traveling or if you feel a bit queasy as it helps to perk you up. I love shimmer palettes and the one from Hikari allows a variety of looks with bronzes, pink and an apricot so you can blend them together; a useful product for everyone that likes a glow. Although I’m not a huge fan of primers, I tried the Evelyn Iona Green Tea Primer and it was a nice product to use, and didn’t feel too heavy on the skin. I’m always interested in brands that are truly vegan and organic, and the fact it contains organic green tea and avocado oil is a bonus for your skin. Primers aren’t always essential to use if you have good skin, but if you do have uneven skin, it can help your foundation look smoother and last longer. Manuka Honey is an ingredient I love for hydration, and so having an extra sheet mask from Vitamasques lit up my face. I’m not a tea drinker, but I like to occasional herbal tea, plus I love rosehips for their antioxidant properties, so the yuyo tea sachet will be one I’ll keep, and lastly the Emily Victora Candles wax melt was in the box, and although I don’t use them, I have more than half a dozen friends who are eyeing it up! Without a doubt, the February box is a great collection of lifestyle and beauty treats, and is the best one I have seen so far. It’s rare to find a subscription box where you are happy with and can use 90% of of the contents, and with the added bonus of a monthly supply of your femcare products. Pink Parcel is a monthly subscription and costs £12.99 a month which includes postage, and can be cancelled at anytime as long as it’s before the 1st of the next month. There are other subscription options that offer savings; 3 months @£35.97, 6 months @£64.95, and 12 months @£124.90 which are all one off payments. There’s also an online shop, so if you find something you like, you can buy it without having to look!